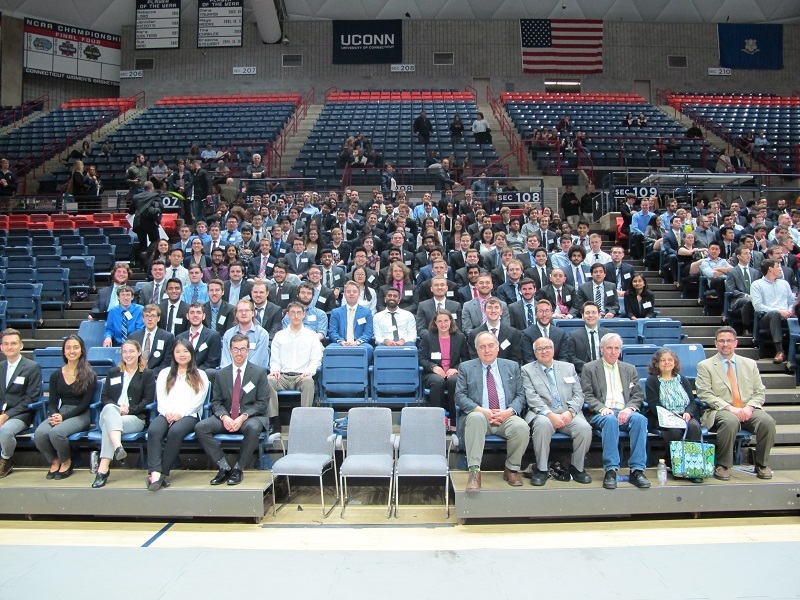 CSE hosted a record number of senior design teams this year with 33 teams presenting their projects on April 27, 2018. Each year leading technology, manufacturing, and insurance companies, financial institutions, medical firms, consulting practices, as well as local and state government agencies partner with our department with Senior Design Projects. These are cost-effective ways to work with Computer Science & Engineering seniors on a company project or a technical design challenge without a large investment. Each project was staffed by a team of 3-6 students working under the guidance of a faculty advisor. Projects were judged by a group of evaluators from industry and academia. Evaluations were based on the overall quality of the project and its presentation including: project idea, impact, design, interface, the poster, demo of the prototype, and the students’ communication skills. Winners received prizes for placing first, second, and third. First Place-Team 7, “Inferencing Based on Machine Stoppages”, Members: Peter Polis, Michael Feldman, Daniel Camilliere, Michael Pappas, Patrick Guyer and Michael Presch. Faculty Advisor: Dr. Swapna Gokhale. Second Place-Team 18, “A Visual Euclid’s Elements”, Members: Soumya Kundu, Sailesh Simhadri, Ian Dechene, Drew Monroe and Joe Sweeney. Faculty Advisor: Dr. Donald Sheehy. Third Place-Team 16, “Smart Hotels”, Members: Arun George, Brian Matuszak, Rafal Bezubik, Chris Skoczylas, Kevin Schumitz and Rich Infante. Faculty Advisor: Dr. Reda Ammar and Dr. Sanguthevar Rajasekaran. Third Place-Team 31, “Hartford Steam Boiler Nameplate Recognition System”, Qiansheng Hu, Chris Peterson, Chengchen Zhang, Eddie Huang, Hunter Hollant and Michael Gentile. Faculty Advisor: Dr. Dong-Guk Shin. Congratulations to all seniors for another successful Senior Design Day and we wish you continued success in all your endeavors!